When an American beat poet from Columbus Ohio passes through your hometown, it is rude and remiss not to lend them an ear. Even when scheduled to play past eleven o’clock in the cellar bar of the town’s quirky left field pub, an itch that something compulsive would surface gnawed away. In an ideal world, forty minutes of Micah Schnabel just gets you into the mood and lays the foundation for a greater serving of sparky folk punk poetry delivered from the sharpest of minds and a beat up guitar clad with the slogan ‘art or die’. This performance binned every media fuelled notion of Americana and took the term back to its rawest form. Micah Schnabel is best known as the front person for indie band Two Cow Garage, but his solo work is bubbling under the surface waiting for that breakout moment when the masses hang onto every word spun out. This current short run of UK dates, the first as a solo artist, has spawned from an invite to play a Frank Turner bash in London, and includes a display of artwork from his travelling companion Vanessa Jean Speckman. 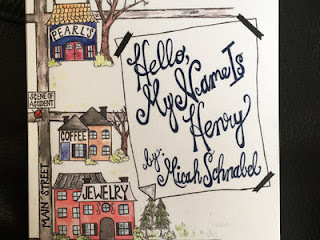 The main creative artefacts drawn from are the latest album YOUR NORMAN ROCKWELL and the sentiment from a brand new published novel titled ‘Hello, My Name is Henry’. New songs such as the explicit ‘I Don’t Want to Die in a Nuclear War’ and the more subtle ‘The Teenage Years of the 21st Century’ also joined the fray as not a single second of the forty minutes stage time was wasted. In a passionate haze of Kerouac meets Strummer, Schnabel smashes the concrete floor to find material that others dare to touch and thus reveal an underside of reality that is stark, frank and poetically expressed. Hanging onto every word sung/spoken was far from an ordeal as a mesmeric hook coated each composition shared. One memorable line after another tossed into the air as a grim view of society was explored in ‘Cash 4 Gold’, the character from the novel introduced in ‘Hello, My Name is Henry’ and the joy of re-connecting with music resonated in ‘Jazz & Cinnamon Toast Crunch’. If you ever have songwriter’s block try asking yourself questions as Schnabel did in ‘The Interview’ and don’t even try to visualise juggling a chainsaw in ‘Oh What a Bummer’. Away from the solo material, a song farmed from the Two Cow Garage catalogue in ‘Shakespeare and Walt Disney’ performed a fully-fledged assault on the concept of conforming love. ‘More Drugs’ left little to the imagination and the title track to the latest album ‘Your Norman Rockwell’ whets the appetite to delve deeper into a record achieving more than just pricking your ears. Yes this was a quirky evening, but one locked into the memory chamber and creating a desire for more. The book bought, and a quick chat with an artist just as keen to learn about your environment, outlook and influences as talk about theirs. There is a market for Micah Schnabel in the UK with a little push and a touch of fortune. Letting him unravel his intuitive mind in a blast of poetic rock ‘n’ roll is not a bad place to be, even when the hour gets late.